FILE - U.N. Secretary-General Antonio Guterres addresses the 73rd session of the General Assembly, at U.N. headquarters, Sept. 25, 2018. U.N. Secretary-General Antonio Guterres remains a "believer" in the United Nations despite U.S. criticism that the world body has lost sight of its founding mission to advance peace, the U.N. spokesman said Wednesday. In a major foreign policy address in Brussels, U.S. Secretary of State Mike Pompeo took a swipe at the United Nations and other multilateral organizations, suggesting they were outdated and catered to elites. "The U.N. was founded as an organization that welcomed peace-loving nations. I ask: Today, does it continue to serve its mission faithfully?" Pompeo said in the address on Tuesday. Asked about Pompeo's remarks, U.N. spokesman Stephane Dujarric acknowledged that there was a "lack of trust" in international organizations but that Guterres strongly defended multilateralism. "The secretary-general has been a believer in the United Nations and a believer in the multinational system for a long time now," said Dujarric. He has been "very clear in addressing the lack of trust ... that there exists in many international organizations," he said. 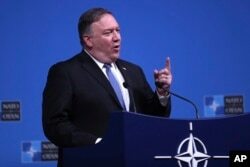 FILE - U.S. Secretary of State Mike Pompeo speaks during a media conference after a meeting of NATO foreign ministers at NATO headquarters in Brussels, Tuesday, Dec. 4, 2018. In his remarks, Pompeo took aim at U.N. peacekeeping missions that "drag on for decades, no closer to peace," and said U.N. climate deals were "viewed by some nations as simply a vehicle to redistribute wealth." "Anti-Israel has been institutionalized,” he said. “Regional powers collude to vote the likes of Cuba and Venezuela onto the Human Rights Council." The renewed criticism followed the U.S. administration's decisions to quit the Geneva-based Human Rights Council and cut funding to U.N. agencies and U.N. peacekeeping missions. On Thursday, the United Nations embarked on two major peace efforts, bringing warring rebels and the Saudi-backed government in Yemen to the negotiating table in Sweden while talks on the decades-old conflict in Western Sahara opened in Geneva. Guterres, the former prime minister of Portugal, who took the U.N. helm in January 2017, has pushed for reforms to make the global body more responsive to world crises. The Socialist politician has had a surprisingly smooth relationship with the administration of President Donald Trump, despite its criticism of the United Nations. By far the U.N.'s largest financial backer, the United States provides 20 percent of the operating budget and 28 percent of the separate peacekeeping budget.